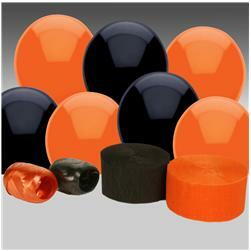 Orange and Black are the colors of Halloween and now you can get perfect Halloween party decorations all in one package! This Black and Orange Decorating Kit features everything you will need to transform your room into a Halloween party environment! Included in this kit: (1) Package of 6 Pitch Black 11'' Latex Balloons, (1) Package of 6 Orange 11'' Latex Balloons, (1) Black Crepe Streamer - 81', (1) Bright Orange Crepe Streamer - 81', (1) Black Curling Ribbon - 50', (1) Orange Curling Ribbon - 50'. Don't forget a Disposable Helium Tank, Sticky Tack and other related items shown.